Beginner sailing lessons will be offered to children 7 – 12 years of age on Holly Pond. 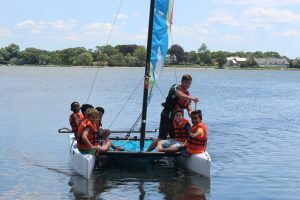 The YMCA’s experienced staff will provide instruction using the YMCA’s sunfish sailboats and catamarans. *On water activities will be canceled during periods of heavy rain and thunderstorms. Children will participate in classroom activities during inclement weather.